This is NOT the complete set, but I'm excited and I have to share. I don't want to brag (maybe I do a little...), but I had this crazy idea about 2 years ago to start providing our Leaders with a newsletter each month that went over all the information we try to push out and get to the girls. Well... what is a newsletter without a crest or logo of some sort, right? We held a contest and asked the girls in our Service Unit to design a logo for our Service Unit. We told them it would be used on the newsletter and event registration our Service Unit pushed out. What we didn't tell them, because we weren't sure, was that we hoped to get it made into a patch! Oh, yeah... a PATCH! If you are a Girl Scout (and chances are if you are reading this, you are...), you know that patches are the best thing ever!! Girls and adults collect them... okay, it's possible I know a few adults that are way more excited about patches than girls, but hey... we give a lot of time if we want a cute patch --> SO BE IT!! The Service Team was super excited and insisted we find someone to make our logo into a patch. It took a while to find a company that could do it and do it well. It is a large patch, 4" in diameter, and we love it! We had patches made of the Service Unit Logo about 6-9 months after the newsletter came out. 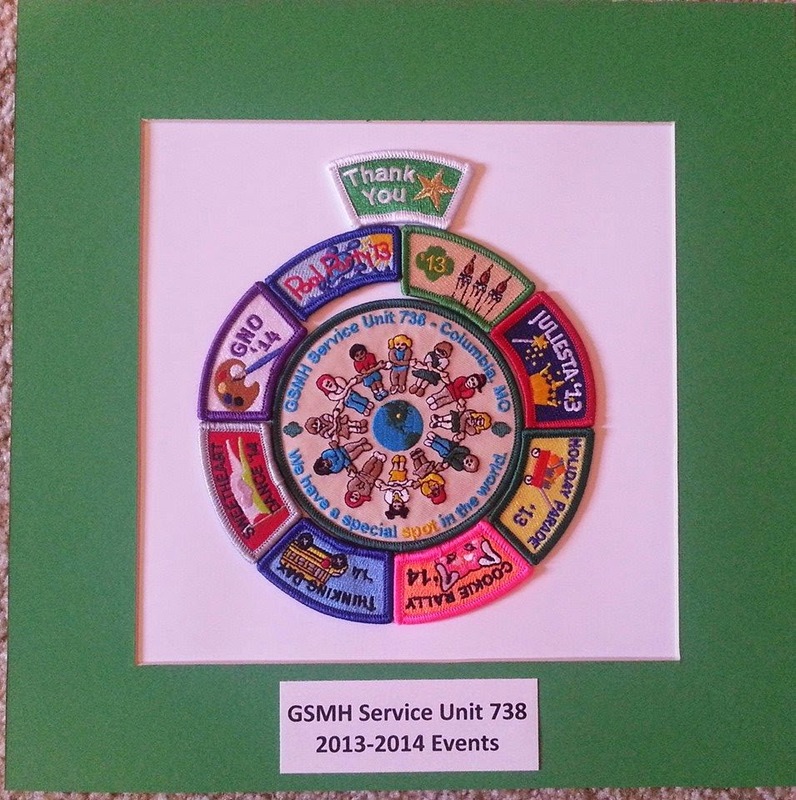 At our Volunteer Appreciation Dinner on April 22, 2014, I presented each of the Service Team Members with a framed set of the event patches and SU logo patch as a gift from me to them. We all work hard. They were happy and I heard "oh! That's why you were insistent and asked if we wanted a rocker for every event." and "Now I see why the Pool Party patch size upset you so much." HA HA!! I love those ladies so much!!! They totally rock. Your service patches look amazing!! Where did you get the patches made? How many Leaders do you work with?